Expect a new froze in SG2D development because the last days development was very unusual 🙂 🙁 ;). Thanks to Niall Walsh for the EFI implementation and testing. Make sure to remove console output when using gfxterm output. This should solve some strange problems when selecting various menus options from SG2D. Thanks to the #grub guys we have managed to improve the code on searching device to make it clearer and some Grub2 code will be eventually fixed so that complex tests are done ok (precedence of -a over -o wasn’t ok it seems). And we also managed thanks to them to avoid two graphical modes at the same time. This way you won’t see strange phenomena when highlighting options. Actually I haven’t been able to test that last fix in an actual machine where I know it happens, but this is a BETA, you’re supposed to test it as an user too ;). So feedback is welcome as always. Well, I wanted to release version an special secret version of Super Grub2 Disk and in the meanwhile I did find some innecesary floppy seeks when using it in an actual machine and I did want to fix that. Fix is not complete but it improves SG2D usage. I also fixed that /boot-isos and /boot/boot-isos error (where only the first directory was searched) for those of you that try to use SG2D for booting loop-boot capable distributions. I’m not providing GZ or ZIP files because I think I will release another SG2D beta soon. I’ve become quite addicted to develop SG2D. I don’t like SG2D myself because I see that the future is Rescatux but… when you get into developing it… knowing the Grub2 scripting stuff and its insights it’s fun and addictive! More than this I want to release an stable version of SG2D soon because it’s too long with the beta versions hanging around. And, of course, the special secret version needs an stable SG2D version so that I don’t have to release it twice. A big thank you to Jordan Uggla for making: Super Grub2 Disk 2.00 beta 1. 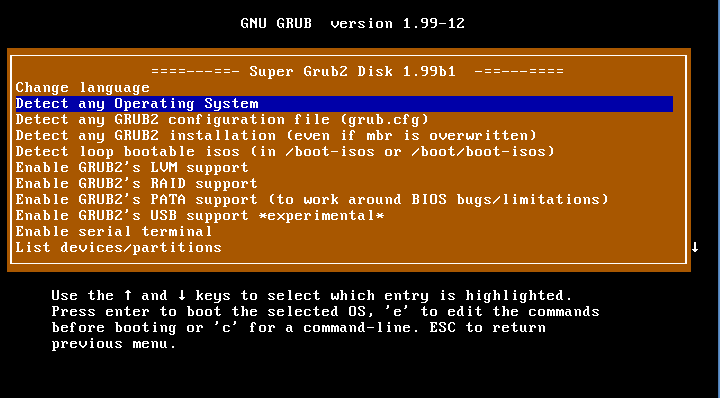 After so much long I am pleased to announce: Super Grub2 Disk 1.99 beta 1. We need translators! Please check TRANSLATION file at source code to learn how to translate into your language.